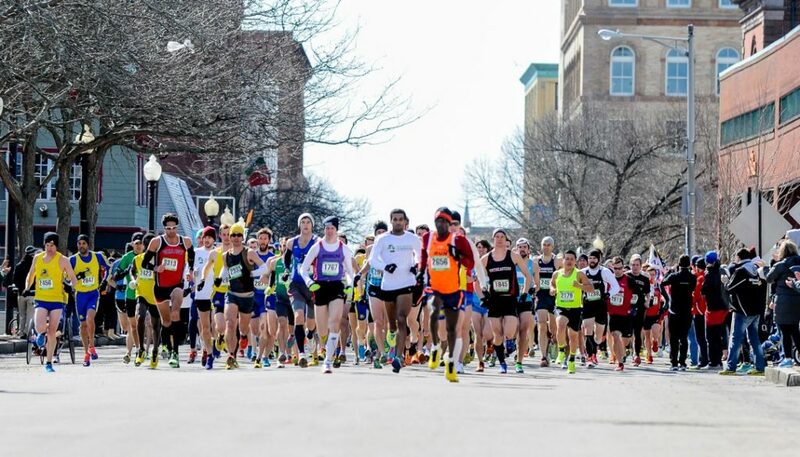 With two of seven races behind us in the USATF-NE Grand Prix Road Racing series – the Jones 10 Miler and New Bedford Half Marathon – where do we stand? and Millennium Running are both holding the women’s open spot. Several teams are nipping at the leaders’ heels in both fields (including GBTC, Whirlaway, CMS and WMDP). The men’s 40+ teams have a tight race right now with the B.A.A., Central Mass Striders and Whirlaway Racing Team coming in with 19, 18 and 17 points respectively. Whirlaway currently holds the men’s 50+ top spot, with Greater Lowell Road Runners coming out on top for men’s 60+ teams. We see Whirlaway yet again as a leader in the women’s 40+ and 50+ contingents. Gate City Striders may be the only 60+ women’s team, but they’ve fielded teams for both Grand Prix races thus far. Nicole Casey in her rear view, each raking in 16 and 13 points respectively. There are a number of other tight races in the age group competitions as well. Next up is the An Ras Mor 5k this Sunday in Cambridge. If you haven’t registered for the race yet, online entries close today at 4 pm – or you can register in-person on race day before 9:15 am. This entry was posted by Jenny Gardynski on March 28, 2014 at 9:35 am, and is filed under Track & Field. Follow any responses to this post through RSS 2.0.Both comments and pings are currently closed.